Whether you’re looking for a dish to bring to a picnic or a main entree to serve for dinner this week, look no further than this cobb salad with eggs recipe! Don’t think of salads as only being a side dish anymore. This recipe has enough great flavors and proteins to fill you up. The tasty hardboiled eggs, crispy bacon, and crunchy greens are sure to please. If you bring it to a barbecue, your friends and family will undoubtedly be asking for your homemade cobb salad with eggs recipe before heading home. This salad is a cinch to make — everything comes together in less than an hour. You could even cut down the time by making the bacon and hardboiled eggs in advance. 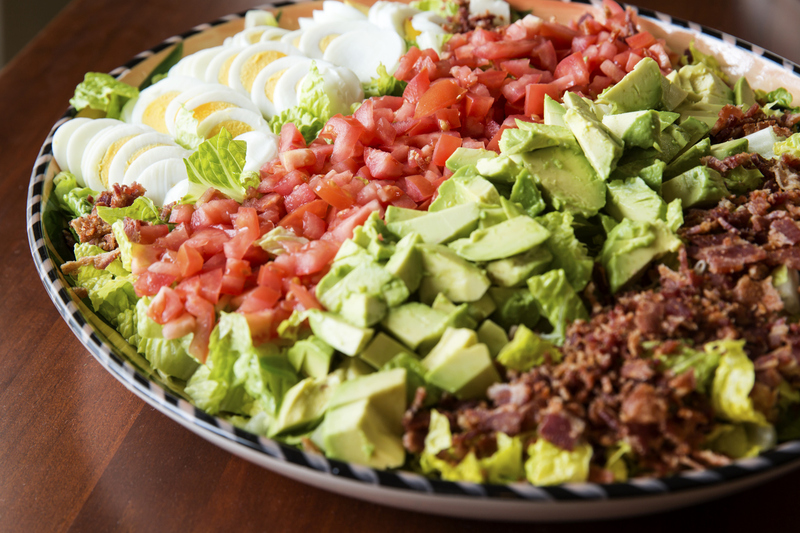 If you’d like to try making cobb egg salad at home, check out our recipe below! In a skillet, cook half the bacon at a time over medium heat. Cook the bacon evenly on both sides until it is crispy. Place a paper towel on a plate, then put the cooked bacon on it. Let the bacon cool and dry, and then crumble it. Set it aside. Put the eggs in a saucepan and cover the eggs with water, 1 inch above the eggs. Over medium heat, bring the water to a boil. When the water is boiling, remove the saucepan from the heat and cover it. Let the eggs sit in the hot water for about 12 minutes. Put the eggs in a colander and run cool water over them so they stop cooking. Peel the eggs and chop them per the recipe. In a small bowl, combine the mayonnaise, red wine vinegar, and Greek yogurt. Season the dressing with salt and black pepper. Add the chopped Romaine lettuce to a large serving bowl. In a separate bowl, gently mix the eggs, avocado, bacon, cherry tomatoes, and cheese. Gradually add the dressing. Use only enough so the ingredients are lightly and evenly covered in the dressing. Season the salad with more salt and black pepper. Put the mixture over the Romaine lettuce and top it with the chopped green onions. Want to make this cobb egg salad recipe even better? Use Sauder Eggs! We give you the finest quality eggs for you and your family to enjoy. Our eggs come from our partnered farmers who agree quality is the most important thing. Make sure you use our store locator to find the closest store to pick up our top-quality eggs today.